Gully Burrows's tweet - "Parisians sing as their beautiful cathedral tragically burns. What an awful day for the City of Lights #NotreDame "
They're singing the Ave in French. There's always a spark of hope amid the ashes. This is so beautiful and tragic and I am so confused as to why it's affecting me so intensely. Wow. The ‘secular republic’ sings the Hail Mary as Notre Dame burns. What a beautiful scene of grace in the middle of terrible sadness. Estive uns anos no coro e nunca fizemos uma cena tão bela como esta. Só os franceses para em 5min arranjar tenores e sopranos valentes e organizados no meio da rua. If this produces a return of anyone to the faith, then the fire would be more than worth it. Dear God. I held it together until this video. French Catholics, rosaries in hand, singing the Hail Mary in sight of the burning Cathedral. im not french, im not christian, im not faithful at all, and still my heart is on fire just like the cathedral is. im mourning with these people like it is my own loss. 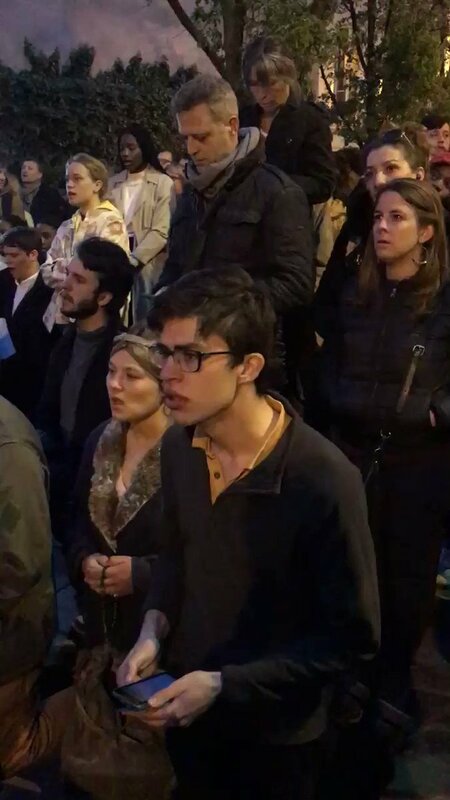 El pueblo francés reza ante una Notre Dame pasto de las llamas. Quizá no esté todo perdido en Europa. Che esto me pone muy triste. Friar Matt Foley, OFM Conv. A stunning tribute, I have so many chills. "Destroy this temple, and in three days I will raise it up again." This is Holy Week embodied: even when all appears lost, we have faith in Christ's Resurrection -- a faith that no fire can ever hope to conquer. Well, this has just about finished me. kakva tragedija, kakva tuga, kakva žalost..i kako Francuzi dostojanstveno i sa pesmom posmatraju kako Notr Dam nestaje u plamenu..
Uniamoci (ognuno con la sua religione o con le sue vibrazioni laiche) alla preghiera cantata dai parigini per #NotreDame. Immagine forte di puro amore. Croí briste do mhuintir na Fraince. I consider myself a very, very lapsed Catholic. Blame eight years of Catholic school and a general distrust of the Church institution and the people who run it. But hearing this and seeing the rosaries out is...a lot. A good reminder that faith isn't always a bad thing. Patrz, Maleńka. Śpiewają Ci ludzie pieśń. Nie zawiedź ich. Con estos sobretodo es que se me parte el alma. Es gibt irgendein Gemälde/Foto von einem Chor im Vordergrund irgendeines Brands oder sonstiger städtischer Katastrophe. Und ich fragte mich immer, wie bekamen die sich organisiert, wer kommt auf die Idee einen Chor vor einen Grossbrand zu stellen, und wozu?! My heart absolutely fell apart when the camera panned to the fire. Oh my god. And yet, they continue to sing, even while it's burning down. Nothing can crush these people's spirits. This is so hauntingly moving. if you ask me, this is real christianity: showing solidarity and empathy in troubling moments. not belching hateful, fear-mongering rhetoric. ho i brividi, mi viene da piangere tantissimo. Hindus are called Sanghi Terrorists if they care and cry about their Temples being demolished by IsIamists. Wierni śpiewają przed płonącą Katedrą.